Link is copy of Crytolocker here. Warning: it works. You can gain some time back by changing date in bios. If you don’t know how, google your computer make (HP, Dell, Acer, etc), model (DV6, Inspiron 15, etc), and phrase change date bios. It should come right up. Turn off your antivirus and disable your antispyware. 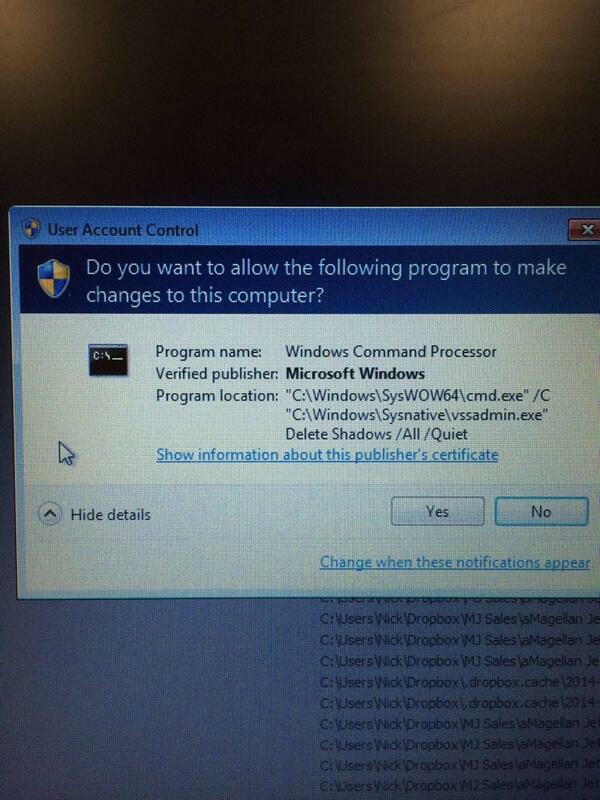 If you have Norton, use the Norton Removal Tool. UPDATE #4 [3.27.2014]: If your antivirus/antispyware removed the CryptoLocker virus, and if you are tech-savvy, you no longer have to reinstall CryptoLocker. Instead, you may install Tor and use CryptoLocker Decryption Service at f2d2v7soksbskekh.onion/. From there you upload an encrypted file and it does a search for your public key. If that sounds tricky, get assistance before proceeding. UPDATE #4.1 [3.27.2014]: Also, a recent computer security survey by UK’s University of Kent revealed that 1 in 30 computers have been infected with CryptoLocker, with 40% paying the ransom. If that number has a scaleable throughout the West, than CryptoLocker has already scammed 100’s of millions of dollars. If one million people paid the ransom, that’s $300 million! In other words, comparable ransom money to that of a small nation’s GNP. And it’s still going on. So yeah, this is crazy. UPDATE #5 [4.3.2014]: Over the past week it’s been busier with an updated Cryptolocker virus. Vector remains same: zip file from email. Rule #1—DO NOT OPEN ZIP FILES IF YOU HAVE ANY DOUBT. It is something that every person in organizations should have explained. NO ZIP FILES. In any case, as ever UK professionals are adamant about not paying ransom. Noble but wise? Or possible? When it’s your files life changes. UPDATE #5.1: This has to do with managing a Bitcoin transaction. An unusual corporate setting with a key individual savvy/confident enough to manage Bitcoin transacted 24-hr CL decrypt without any previous knowledge of Bitcoin (usually I reinstall virus and use Greendot Moneypak). However, aftewards he was spent. Why? Because getting Bitcoin is only remotely like any other sort of transaction ordinary people are used to. It’s actually mostly unlike any other type of ordinary transaction. You should know: Knowledge of Bitcoin is not easily attained. Neither is quick purchase/trade of Bitcoin. However, in order to make it happen, you have to 1) prove to Bitcoin seller your identity is legit, and 2) move smart & fast because time is of the essence. Update #5.2 9 [4.3.2014]: Cryptolocker now deletes shadow copies. So: Do not waste valuable time going after shadow copies if you are planning paying the ransom/going Bitcoin route. With that in mind, our next step then was bold: We paid the $300 ransom. Unbelievingly the program actually did what it promised. The files were decrypted. We recovered the files. All of them. At this time, I just have three things to say. The last is the most important. First, update your Windows** antivirus, antispyware, and java program. Second, do not open any attachments that come as .zip files. I have asked my wife at this time to not open any mail attachments at all. None. Lastly, most important, backup your files and data to an external harddrive or an offsite location. I do both: backing up to external harddrives (available at OfficeMax etc) and setting up Gillware exclusively for my off-site backups. As you know, I have been hands-on computers since 1979. 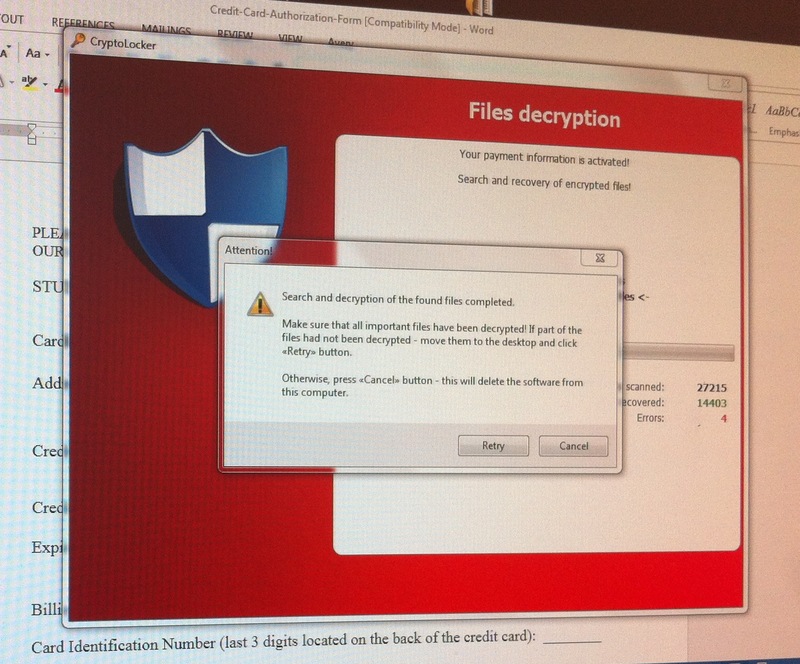 Cryptolocker is unlike any attack I have ever seen. So you know, it is not the “FBI has taken control of your computer” virus. Everyone asks that. It is not that. Now I am talking with Congressman Joe Garcia’s office and the FBI have bumped me up to the next level. My guess is Cryptolocker will be front page news within the month if not week. I will tell you more as I have more. 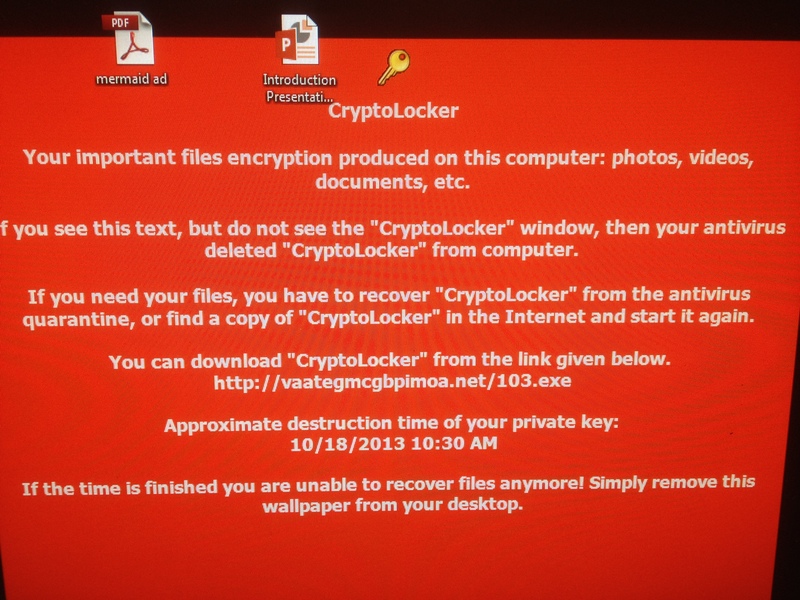 One thing, if you get Cryptolocker do NOT erase it off your computer. (If you have another IT person, they may call me.) You will need it to get your files back. In fact, the virus after being deleted leaves a message on the desktop explaining as much. 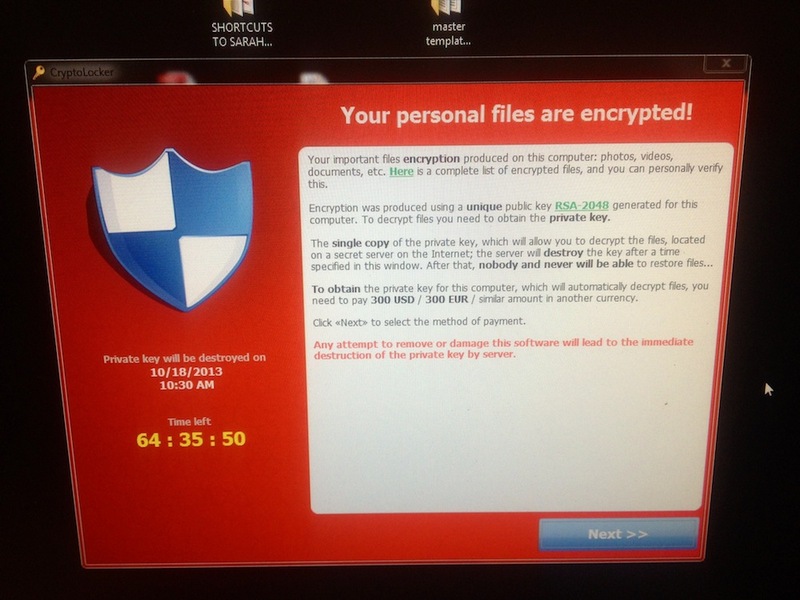 When people say, “Watch out for the Cryptolocker virus” they are confused. It is more than a virus. It is an brilliantly executed act of high-tech extortion using tools that are outside of the ordinary computer user’s hands. This is science-fiction. This is the new model. And as of two days ago, it is reality. Head’s up. Call if you need, back up your files today. And you may want to buy a Mac**. * Please note the encryption is an assymetrical encryption. It requires two keys, one in the virus on the computer, they other on the Cryptolocker server. The key on the Cryptolocker server is 1024-bits long. Along with the key from the virus, it is unbreakable. Not even brute force decryption can undo the encryption. Removing the virus only leaves encrypted unusable files. ** Macs are safe, as are iPhones, tablets, and Android devices. Cryptolocker only affects Windows computers. UPDATE: We paid the $300. There was a 2-hour wait, then decryption started. It took 8-hours all-in-all, and 14,400+ files were decrypted. It worked. All the files were decrypted. The PC has now been been backed up, doubly reinforced and my friend is presently actively switching to Mac. But the most noteworthy thing: It worked. This was extortion, plain and simple, and it worked. And I and my friend and her entire staff were overjoyed. Classic Stockholm Syndrome responses. However, the other option was terrible. My question is: what are the attackers using the money for? It’s all too well-conceived to be ordinary. The conversation with FBI continues. Stay tuned. I was hit, but I had backup of the server. Does FBI is doing something about this crime?… should I report it? Thanks. Obviulsly we will not pay. That is not my recommendation. That is a business decision. If you have proper backups then you are good. Hi, my work computer was infected and all of the shared drives were encrypted. We are currently waiting to get out ransom money cashed so we can get access to our files. However, I noticed you said Iphones are not affected, but my Iphone all of a sudden has had spammy notifications in place of my actual notifications for mail and Twitter. It was hooked up to the computer so opportunity was there. Can we get research behind this? The operating systems of the two devices are completely different. The attack vector for one is not transferable as an attack vector for the other. What is the password to sample2.zip? The above password “infected” does not work; can you provide me the new archive password? Thank you! Hmm. Really? I will look.